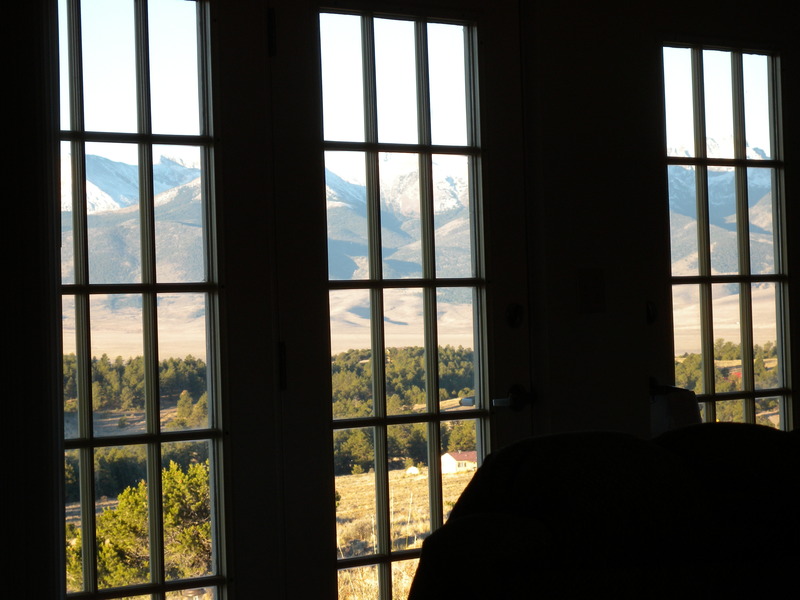 Linda Burton posting from Westcliffe, Colorado traveling between Denver, Colorado and Santa Fe, New Mexico – I’m taking a break. Two weeks in the Colorado Rockies, in the autumn of the year. Expect no posts, beyond today, till I get to Santa Fe. I’m at son Mike’s and Brenda’s house, but they aren’t here, it’s just me and the cats. Yesterday I ate lunch at Rancher’s Roost Restaurant in a bowling alley in downtown Westcliffe. A cute little bowling alley; a spectacular view of the Sangre de Cristo Mountain Range and the Wet Valley from the restaurant. As I ate, and stared, I thought about telling the owner to move the booths away from the windows so as not to block even one inch of the scenery. There’s one grocery store here, where I bought 21 bags of groceries today. I may not leave the house again till time to go to Santa Fe. Look at these pictures, and you’ll see why. The great room overlooks the valley and the mountain range; deer come near the dining room window to graze; we watch each other eat. Two bedrooms and two bathrooms with the same view; the kitchen too. Every room is perfect; why leave? Meanwhile, here are some straight facts on the area around me. 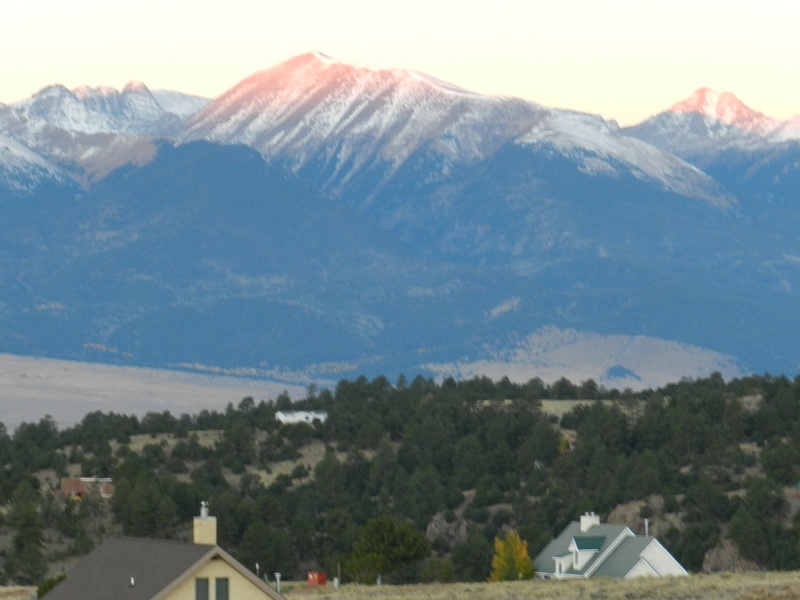 Westcliffe is a quaint little town in the Wet Mountain Valley, nestled between the beautiful Sangre De Cristo Mountains and the Wet Mountain Range. Elevation is 7,888 feet; population is 568. Neighbor town Silver Cliff has a population of 587; total population in the county of Custer is 5,410. The Wet Mountain Valley is a high elevation mountain valley known for its historical ranches and excellent hay production. The valley is drained by Grape Creek and Texas Creek; both flow towards the Arkansas River. 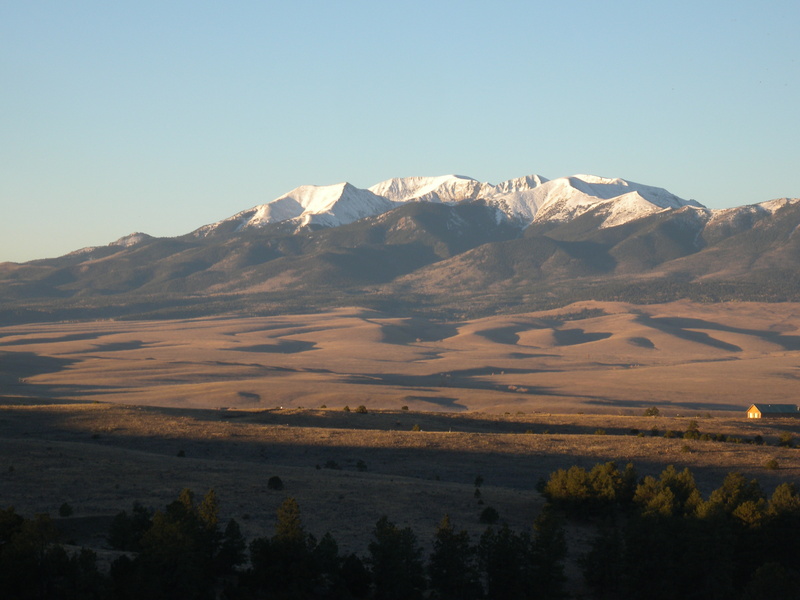 The Sangre de Cristo Mountains are the southernmost subrange of the Rocky Mountains. They are located in southern Colorado and northern New Mexico and run from Poncha Pass in South-Central Colorado to Glorieta Pass southeast of Santa Fe, New Mexico. The Colorado portion of the mountains contains a number of 14,000-foot peaks. The name Sangre de Cristo, Spanish for “blood of Christ,” is said to come from the red color of the mountains sometimes at sunrise and sunset, especially when they are covered with snow – alpenglow.